St Andrews cricket club should be excited about the future in store. This season has been another great example of the principle that hard work pays off. 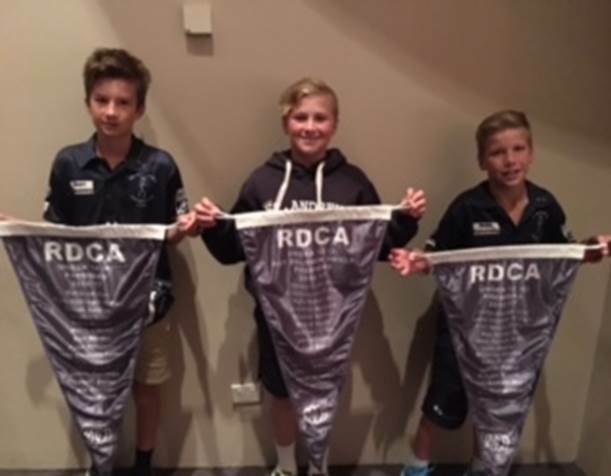 The season contained many highlights, capped off by three junior premierships with the U14/4s, U12/2s and U12/6s all winning their grand finals providing the junior club with its most successful season in its 54 year history and recognition by the RDCA as the most successful club in competition. Along with the U14/4s coming runners up after a great season and the U16/3s making the semi-finals only to lose a close one it all contributed to a huge celebration at both the St Andrews and RDCA junior presentation nights. This season we fielded 89 junior cricketers across 4 age groups from U10 to U16 and our in-2-cricket program (formally Milo Cricket) involved 21 participants. We were one of four clubs who fielded an U14 Friday night team for the first time but unfortunately due to dwindling numbers and team withdrawals the U14 Friday competition was disbanded after Christmas. We saw the introduction of further rule changes as directed by Cricket Australia to reduce the length of the pitch for U10, U12/5 and U12/6 grades. The intention of this initiative is to create a realistic pitch length for players in these grades reducing the number of unplayable deliveries and providing greater opportunity for running between wickets. These changes were trialed prior to Christmas with positive feedback resulting in a permanent rule change and the likelihood of introduction to other grades in season 2017/18. The results have been outstanding with a notable reduction in extras and an increase in runs scored of up to 40% in some grades. 22 juniors played senior cricket for St Andrews in season 2016/17 with highlights including Leith Mayoh making his maiden century, Jesse Lynn taking 5/10 in the 5th XI, Lachie Wynd debuting in the 1st XI, Jesse Lynn being picked in the Jackson/Harvey team of season 16/17 and both Nick Wunsch and Sam Wong playing key roles in the 7th XI premiership victory. · A very successful T20 season for our U12’s, continually matching (and beating) some very strong U12/1 sides. I hope our U12 kids continue to put their hand up for this competition next season. · Fielding an U14 T20 team for the first time. · An incredible Christmas Party celebration again – what a night! The next 2-3 years are crucial for the ongoing success of our junior club. We are in the top five largest junior clubs (equal second largest senior club) and we are the largest club in the local area. We are ambitious and are continually looking for new benchmark measures to ensure continuous improvement in everything that we do. We are fortunate to have a great junior committee that is hard working and committed to creating a great environment for our junior cricketers to thrive and enjoy the game. We are always looking for extra people (specifically a treasurer) to step up and join the committee. On behalf of the committee, we look forward to hearing from you! We look forward to season 2017/18 and with ongoing recruitment and building on excellent relationships with local primary schools we aim to field at least 10 junior teams next season and our first girl’s team. The future looks very bright - Go Saints!!!! !